Pinkerton's extraordinary 1818 map of the 'Remote British Isles.' Essentially three maps in one, this chart depicts the Scilly Isles, the Shetland Isles and the Jersey and Guernsey Islands. Upper left map depicts the Scilly Isles, naming each, and identifying various undersea dangers in the channels between the islands. 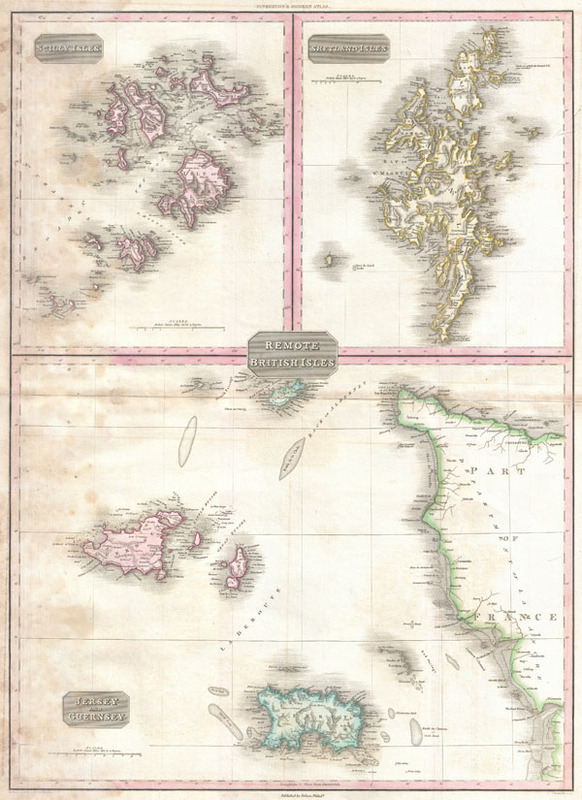 Upper right map details the Shetland Isles, naming each as well as offering inland details. The lower half of this map is dedicated to the Channel Islands of Jersey, Guernsey and Alderny. Also includes a significant portion of adjacent France. Shows numerous undersea dangers and shoals in the English Channel and around the islands. Good condition. Mild to moderate damp staining in lower quadrants. Original centerfold exhibits some toning. Blank on verso. Rumsey 0732.014. Phillips (Atlases) 724. National Maritime Museum, 409.